We have just made it through our first super snowy weekend of this winter season…and technically it isn’t even winter yet. The snow fell all day Saturday and left a blanket that is about 15 – 20 cm deep. Snowy weekends are the best. No one is in a rush to get anywhere. We can take our time shovelling the snow, playing in the snow and looking out the window at the falling snow. For whatever reason when it snows like this I immediately have a craving for comfy and warm pasta. In the summer time our pasta might be lightly dressed with olive oil and garlic or a simple basil pesto. 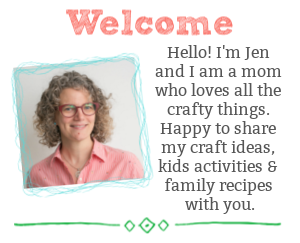 In the midst of a wintery wonderland weekend, all I want is a rich sauce and cheese. 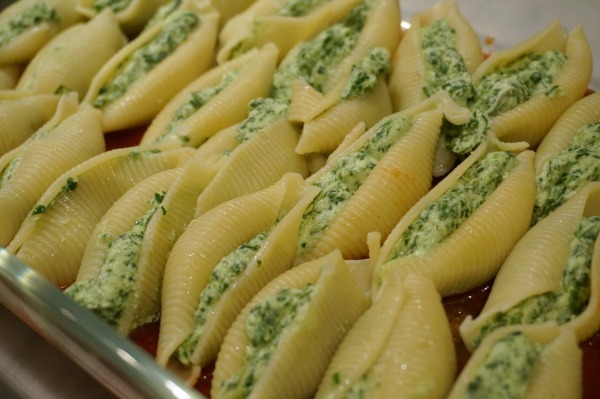 This weekend we baked up delicious stuffed pasta shells with ricotta and spinach. Add to that a side of homemade foccacia and you’ve got a perfect snow day dinner. 1. 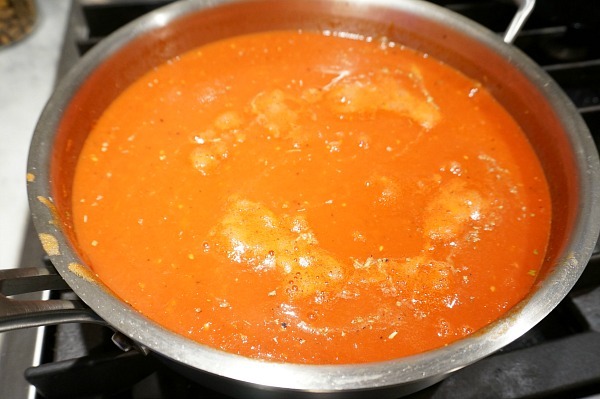 Make a basic marinara sauce, this recipe will yield enough sauce for this dish and leave about 2 cups left over…I like to make my marinara sauce in bulk. Begin with a medium saute pan, pour in olive oil. Add in grated scallion and minced garlic…I grate the scallion because my youngest daughter is going through a “I’m going to pick out pieces of scallion” phase. Saute on medium heat until they begin to soften. 2. Add the cans of tomatoes. I add the liquid from the cans first, then I use my emersion blender to crush the whole tomatoes inside the can, before pouring them into the pan. If you like a chunky sauce, leave the tomatoes whole. Add the oregano, basil and some salt and pepper. Bring to a boil, turn down to a simmer. Simmer for about 1 hour. 3. Prepare the filling for the pasta. Rinse and dry the spinach. 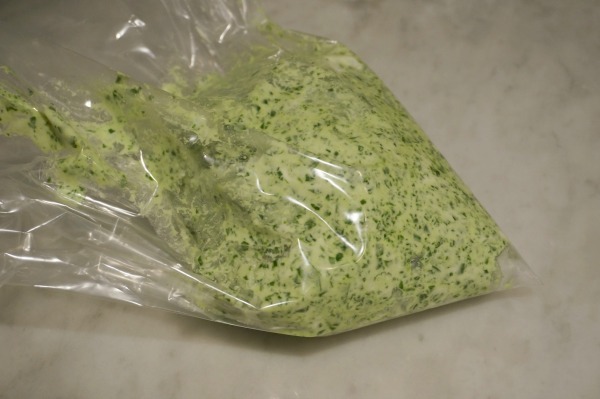 Process the spinach in a blender, food processor or chop finely with a knife. Add spinach to a large bowl. Mix in ricotta cheese, 1/4 cup grated parmesan cheese, salt and pepper. 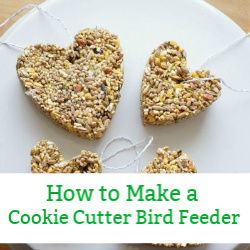 Transfer to a large resealable plastic bag. The bag will become a piping bag and will be used to fill the pasta shells. Place in the refrigerator until it is time to fill the pasta. 4. Cook the pasta shells according to the package directions. Once cooked, drain and toss with a little olive oil, you don’t want them to stick together while filling the pasta. After the pasta is cool enough to touch, snip the corner off the piping bag, creating a small hole where the filling can come out. With the pasta shell in your one hand, pipe the filling into the shell. 5. 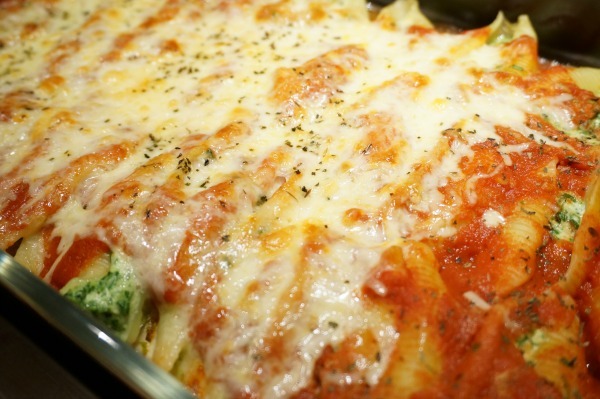 Place the shell in a baking dish, that has been lined with 1/2 cup of marinara sauce. Continue to fill the pasta and place in the baking dish. Tuck them all in tightly. Once all the shells are filled and placed in the dish, coat with 1 to 2 cups of marinara sauce. Sprinkle with mozzarella cheese. Cover with aluminum foil and place in a 350F oven for 20 minutes. After 20 minutes, remove the cover return to the oven for an additional 10 minutes. I like to switch on the broiler and brown the top of the pasta…keep an eye on the pasta it browns very quickly. Let the dish rest for 10 minutes and then serve. Enjoy! 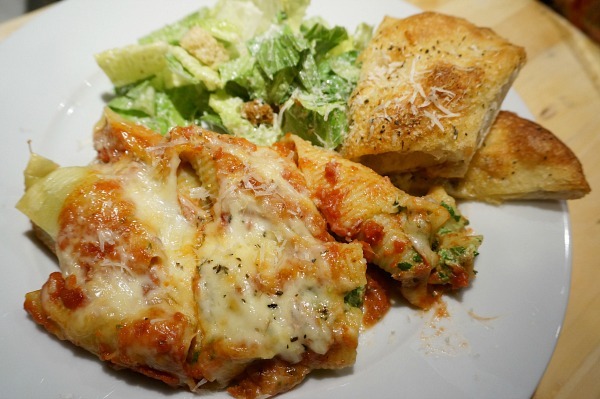 We served our baked stuffed pasta with a simple side salad and some homemade foccacia bread. This dish filled our stomachs and warmed our hearts. It was the perfect way to end a snow filled weekend. 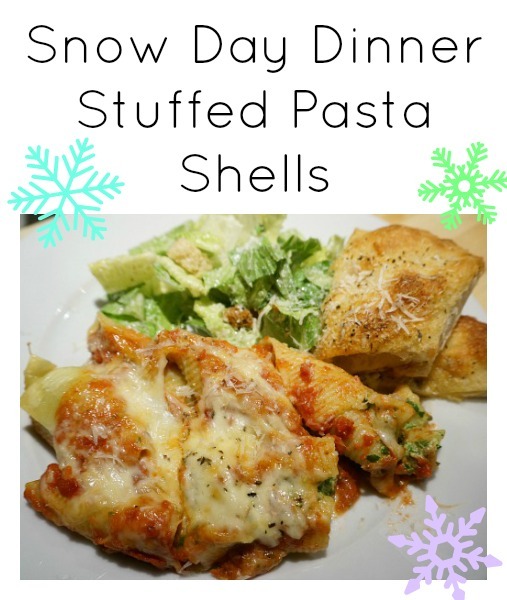 What is your favourite dish to eat on a snow day?